Fancy a walk up in the trees? Upstate New York now has its own "High Line" of sorts at the Wild Center in Adirondack Park, part of the Tupper Lake area. 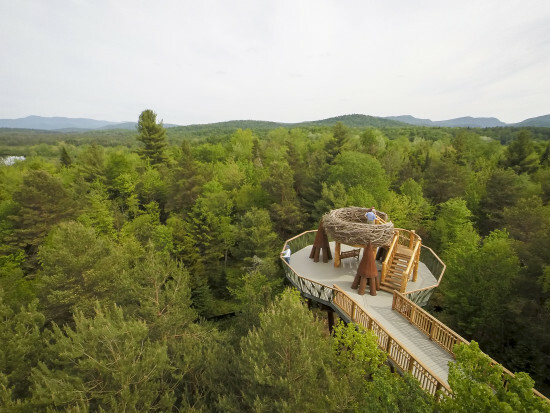 Designed by Charles P. 'Chip' Reay, a former senior vice-president at HOK, the Wild Walk is an addition to the current Wild Center at Adirondack Park which was also designed by Reay. The elevated walkway takes you into the natural world, offering spectacular views over the park from a full-sized replica bald eagle’s nest in the tree tops. Here people can easily visualize the life of the species which have made a huge comeback to the Adirondacks. The feature is only one part of the journey through the woodland as you are submersed into the life of the forest, even traveling through old tree-trunks at points. Other features include a "spider's web," a four-story twig tree house, and swinging bridges mainly aimed at children, creating the opportunity for play in an elevated setting that would otherwise just be used for viewing purposes. Speaking to AN, Reay emphasized his idea to "create a more intimate experience," especially in relation to the center itself. "Wild Walk is much more of a journey inward" said Reay. "The journey offers a diametric opposition to what goes on in the wild... think of it as simplifying the forest geometry, we really didn't want to create a 'Disney effect'." Indeed the walk appears anything but Disney-like. Careful selection of materiality stops the experience from feeling synthetic and artificial. Pointed towers, fabricated from Corten steel reflect the surrounding natural context. 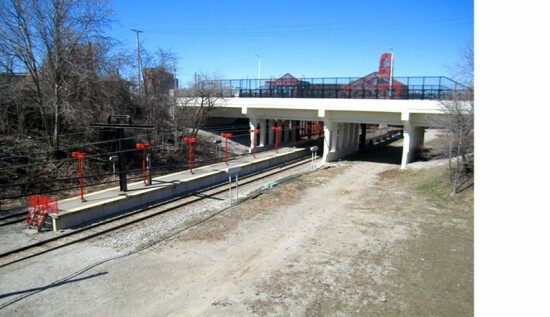 The spikes rise to support various bridges and walkways. Meanwhile, tree houses make use of shingle-clad roofing. The constructed space, however, is clearly defined from its wild setting, just not abstractly so. In turn, users can feel safe, being secure in the knowledge that the steel structure is more than adequate despite their presence in the lofty heights of the forest. In constructing the walkways, Reay was was quick to comment on how the process involved minimal disturbance to the surrounding area. According to Reay, the exhibit fabricators, Cost of Wisconsin, played a big role in this, giving special attention to specially preparing the concrete and shielding wildlife from the construction site. Wild Walk also takes cues from its New York City counterpart, which looks downright low in comparison. Described by New York Times critic Nicolai Ouroussoff as "mesmerizing," the High Line was successful in part due to its elevated nature which offered an alternative perspective of the city and providing an uninterrupted route across the city grid. "It is the height of the High Line that makes it so magical, and that has such a profound effect on how you view the city," said Ouroussoff. "Lifted just three stories above the ground, you are suddenly able to perceive, with remarkable clarity, aspects of the city’s character you would never glean from an office window." Likewise, Wild Walk offers an equally unique outlook on the forest and perhaps one that many city dwellers have never seen before. 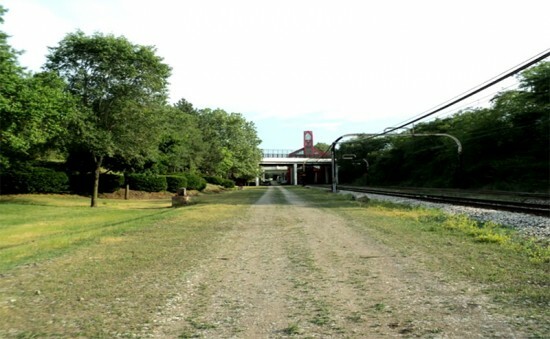 Currently, 80 percent of U.S. citizens live in cities—and the Wild Center hopes to lure some of those urbanites out into the country with their Wild Walk experience. From Boston to San Francisco and cities in between, increasing the quality of livable and usable urban space has become a hot issue. 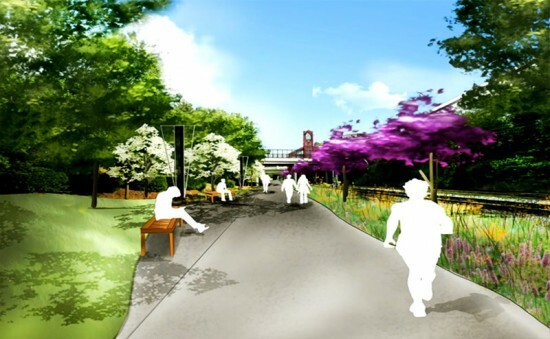 Waterfront redevelopment, highway removal, and linear park creation (and activation) are leading the way. 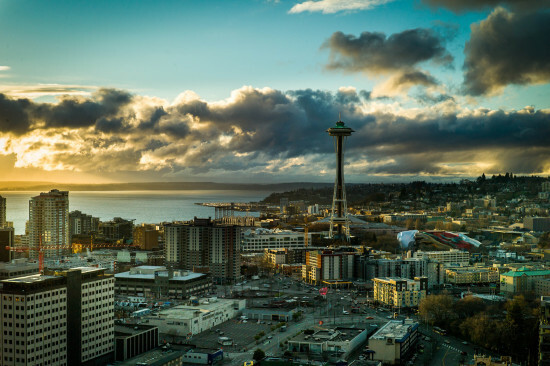 For Seattle, that means redoing the waterfront by replacing the deteriorating seawall, removing the earthquake damaged Alaskan Way Viaduct, and building a tunnel. When these projects are complete, it also means carrying out James Corner's massive over $1 billion waterfront plan with proposed features like a public promenade, lookouts, a dedicated bike path, and more, that would wind along the western edge of the city from Belltown and south to Pioneer Square. Other related projects also include a Pike Place Market addition, an aquarium expansion, and Pike-Pine improvements, among others. But a new kid on the block is trying to shake things up. Enter Initiative-123. Seattle-based Kate Martin (who ran for mayor in 2013) is leading a competing vision to the James Corner plan. 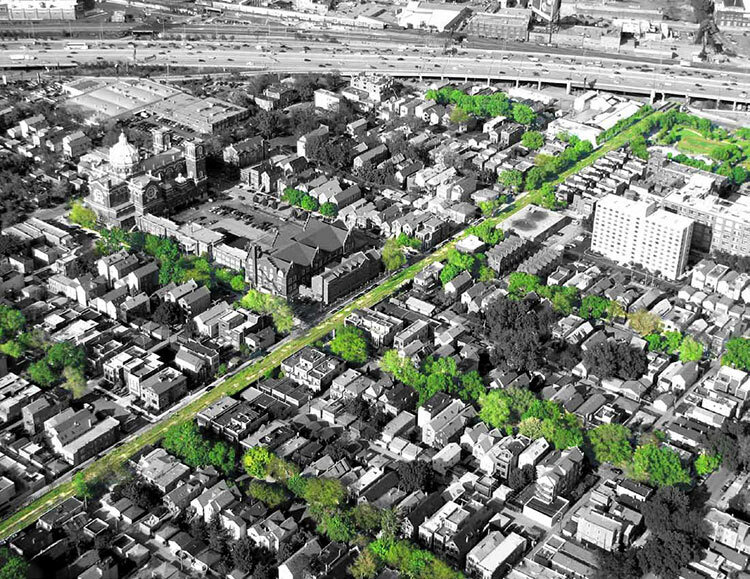 The opposing proposal calls for a mile-long, six-acre elevated High Line style park. 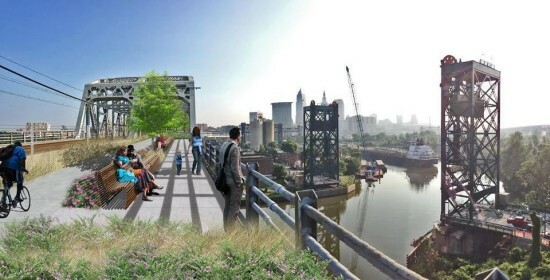 The idea is to reinforce and convert a southern portion of the viaduct into a promenade and then extend it, rebuilding an entirely new portion as a dedicated haven to walkers and cyclists. 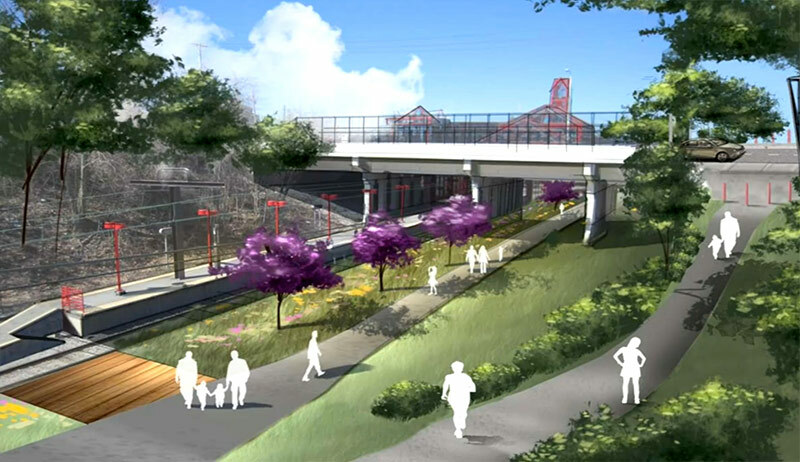 "Elevated parks are at the forefront of urban open spaces and delays in the unimproved plan have created an opportunity for a re-imagining of Seattle’s waterfront," reads the I-123 policy. 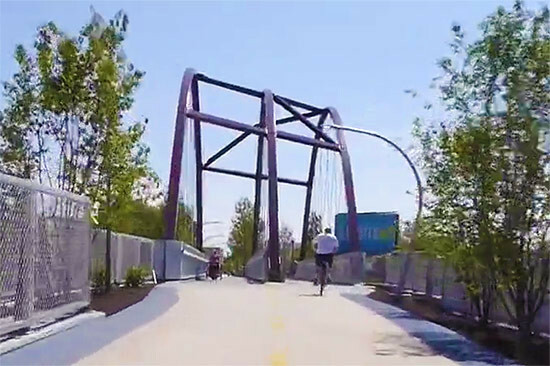 "The city’s unimproved waterfront plan attempts to mix commercial, transportation, and pedestrian space into an end product that doesn’t meet any of these users’ needs." The proposal is gaining traction, recently getting enough signatures (over 20,638) to go before the city council on August 17. With the council expected to reject it, I-123 would then get put on the ballot, and possibly be up for a citizen vote next summer. And should the ballot measure pass, it would establish a public development authority. If this happens, "it is going to create serious problems, with the millions of dollars that have already been spent,” City Council member Sally Bagshaw told the Seattle Times last week. For now, we wait.